Had my baseline ultrasound yesterday and got the go-ahead to start the stimulation medicine today. So this evening, Colin will get the honor of giving me two shots in my belly – what better way to wrap up a Friday date night! The nurse led us through an injection training session, during which Colin dozed off and didn’t perk up until he heard the nurse say something about his prescriptions. He resumed napping once she reassured him that he would be taking oral medications, not shots. Of course, I am not looking forward to getting a couple of shots a day throughout the course of October; however, I feel somewhat prepared, having gone through a few years of allergy shots 1-2x a week when I was younger. I was that nerdy kid who couldn’t play outside in the spring due to the sneezing fits I’d get whenever I breathed in the heady scent of Scotch broom pollen. But, as Emily reminded me earlier this week, at least I didn’t have to wear an oxygen mask in public places and be shipped off to asthma camp like Justin. 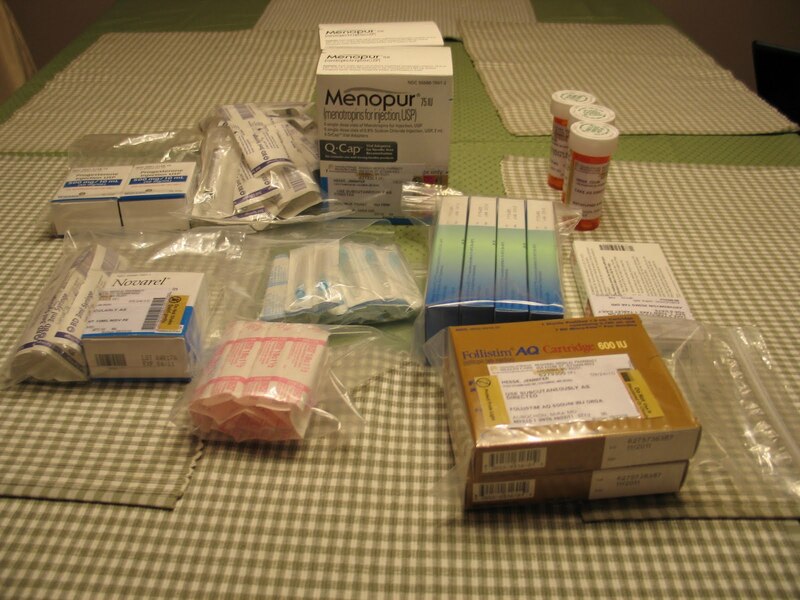 Learning how to use all these injections was definitely daunting, and paying for them wasn’t exactly a blast, either. Walking out of a pharmacy with a grocery bag full of meds was a new experience for me, one that I hope not to repeat. The sheer volume of drugs, needles, alcohol swabs, and other paraphernalia was so ridiculous I decided to take a picture of it all laid out on our table. Note: This pic was taken before I got more needles and an injection pen at my appointment. Impressive as it is, this supply doesn’t hold a candle to my mom’s Port-a-Pharmacy she makes my dad lug around everywhere. She likes to have this cache of meds on hand for her autoimmune flare-ups and everyday emergencies – you know, like if someone happens to get typhoid fever and needs heavy-duty antibiotics. Big Pharma owes Mom a big thanks, as do I – she has set an amazing example for enduring health issues with grace and patience, an area I’d like to grow in as we proceed with IVF. A few people have asked me if I’m excited to begin IVF, to which I would answer that I’m as excited as one can be about starting an expensive, emotionally and physically taxing process that has a 50/50 or less chance of resulting in us having a biological child. It is exciting to be moving forward in our path to parenthood and nerve-wracking to wonder if the procedure will work. Beyond that, it is comforting to have family and friends encourage and pray for us during this time of uncertainty. We are extremely grateful for your support. Just read your most recent posts. Had been wondering how the shots were going since Friday. Is Colin still giving them to you or are you able to do them yourself now? I found that if you find the fattest part of your tummy and squeeze out a chunk, you almost can't feel a thing. Those needles really are small, nothing like those HCG shots you have to do in your hip muscle. Email me when you get a chance and let me know how things are going. Thinking of you.